The camera will autonomously track selected objects such as moving vehicles or persons within a track-box. Operators can command the camera to point to a specific GPS coordinate on the ground, such as an intersection or point on map. The camera will automatically follow the selected image “scene”, greatly reducing the camera operator’s workload. System includes selectable user-defined overlays including aircraft and target coordinates, target range, camera field of view, date and time, and north indicator, all with or user-selectable option. 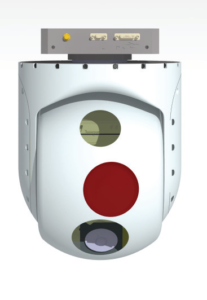 System can display video from multiple cameras simultaneously in a user-configurable picture-in picture, allowing operators to view daylight and thermal imagery, or narrow and wide fields of view, at the same time. Via hand-controller or keyboard commands, includes play back and video export function. Easily designate an item of interest, with the item location noted on the map and a snapshot image saved in a separate recording file.